What happens when you take a Mompreneur mind and you optimize it? Just about everything possible! You are a magnificent mompreneur. Let’s talk about to nourish yourself, your relationships, and your business. This podcast has been created to encourage you to do that. The Secrets of Magnificent Mompreneurs is sponsored by Magnificent Minded Studios and the new Maximized Mompreneur Magazine. 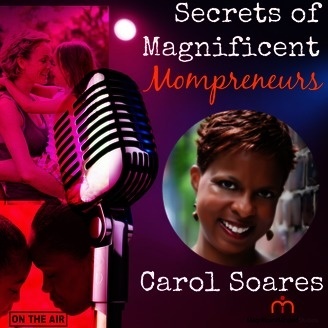 Join host, Carol Soares, and Mompreneurs who are talking about the power of our minds, secrets to success, and stories of their journeys along the way. Kelli Miller is a Down-to-Earth, Hilarious, and Professional Psychic/Medium, Life Coach and Transformational Speaker in the Omaha area! As a psychic, Kelli can provide guidance and direction in areas where you feel lost and confused. She can receive messages from your deceased loved ones in spirit and your spirit guides. Therefore, Kelli can help you connect with guidance from both energy and spirit to help you heal your life, your grief, your relationships, your career, your financial issues, your body and even your soul. As a spiritual adviser and life coach Kelli shares insights into your own talents and strengths, helping you to maximize your potential.